Nepal Telecom, Ntc has brought Live TV portal to their customers. Although the portal was there from before, they have revived the portal and now world cup football can be streamed live from Ntc. Know more information and data packs for NTC live TV football streaming below. The dedicated live TV portal will stream many sports events including the latest World cup football. The portal can be accessed using NTC mobile data. Ntc has brought special data packages for this football streaming in Live TV portal. 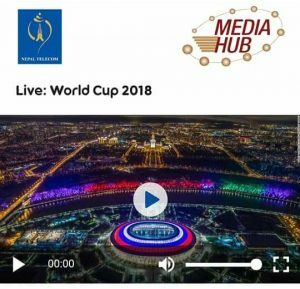 Ntc has partnered with Media Hub for this live TV streaming of Fifa world cup. Connect your mobile with NTC mobile data and access the live TV portal at livetv.ntc.net.np. The live portal can also be viewed from the laptop, computer or other devices if the internet is used via hotspot from NTC mobile data. There are two different packs for Ntc live TV football streaming. 1 GB data pack for 2 days validity @ Rs 45 plus taxes. 4 GB data pack for 7 days @ Rs 150 plus taxes. How to buy Ntc live TV football streaming packs? Send a message Football1 or Football4 for 1 GB or 4 GB pack.